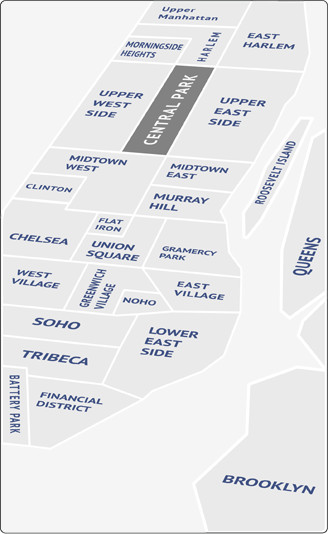 Upper Manhattan denotes the neighborhoods more northerly in Manhattan. Its southern boundary is around 155th Street. The neighborhoods of Marble Hill, Inwood and Washington Heights (including Fort George, Sherman Creek and Hudson Heights) are all parts of Upper Manhattan. Upper Manhattan is generally ignored by most tourist maps and many New Yorkers tend to treat it like another borough. These neighborhoods however are quickly becoming gentrified as increasing numbers of professionals with higher incomes seek affordable housing. The area is diverse in culture, and has an abundance of parks and river views. Upper Manhattan is now building a new reputation as one of Manhattan’s hottest, trendiest areas. There is historic pre-war architecture that houses grand five- and six-room apartments as well as condo buildings with the Manhattan attitude and sleek interiors. You don’t have to pay big prices to live in a shoebox apartment if you want to live in Manhattan. In Upper Manhattan, it costs half the price for double the size. For the city’s best chicken, there is Malecon-The King of the Roast Chicken. You can have a panini while you taste wine at Vino Veritas. Hang out with the NewYork-Presbyterian/Columbia University Medical Center crowd at the self-proclaimed, European chic,Columbia Social. United Palace, once a movie palace, is now the backdrop for top international rock and pop acts. The Annual Latin Grammy Street Party in Inwood Park is where top pop stars of the Dominican Republic perform. Have a drink and sing karaoke at Coogans. Visit The Cloisters, a branch of the Metropolitan Museum of Art, built resembling architectural elements of medieval abbeys and used to exhibit art and architecture from Medieval Europe. Jog north through Riverside Park and come across the Little Red Lighthouse underneath the George Washington Bridge. Take a bike ride down the Hudson River Greenway.